Ohio University doesn't get a ton of national attention, and that's how a player like Eric Herman can go unnoticed. However, the draft process offers an opportunity for someone like Herman to make a name for himself. He has the type of game that will easily translate to the next level. Herman combines natural athleticism and strength with a non-stop motor. NFL teams will quickly fall in love with his competitiveness. 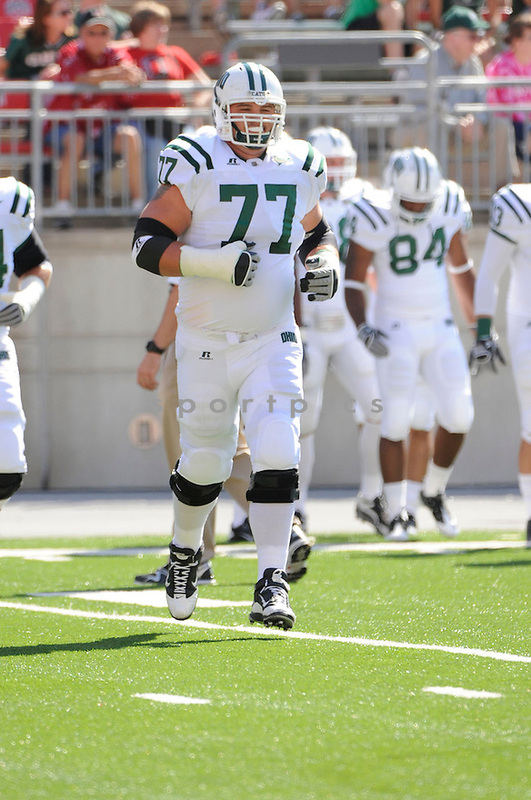 Intangibles/Character: Ohio University benefited from the reliable and high-level play of Eric Herman. He started 40 straight games from his sophomore to senior season. Herman played each of those games with a ton of intensity. System: Herman’s size and raw strength make him a great fit for a power-blocking system. However, he also possesses the quickness off the ball to fit into a zone-blocking scheme. During his time at Ohio, Herman gained a ton of experience in a zone system. Pass-Blocking: The most important thing Herman needs to focus on in order to become a complete player is his pass protection. He boasts the athleticism and strength to excel in this area of the game, but he must improve the consistency of his technique. One thing helping Herman is that his future in the NFL is at the guard position. This will provide him some leeway to clean up his pass-protection technique. Run-Blocking: This is the area of Herman’s game where he shows the potential to dominate. He does a great job driving defenders off the ball, quickly getting off the line and gaining inside hand placement. The image below is an example of how his quickness off the ball can seal the defender from a hole. He quickly got across the face of the defender and kept him from making a play on the ball. This quickness also comes into play when Herman is asked to pull from this guard position. The below clip shows Herman’s ability to remain balanced as he provides a lead block. Don’t be surprised if Herman comes off the board earlier than expected. Teams are going to fall in love with his combination of athleticism, strength and mean streak. Blocking in Space: Herman doesn’t possess the fluidity to consistently hold up in space. This is why his best position at the next level is at guard. However, he’s a good enough athlete to fill in at right tackle in a pinch. This is only a real possibility if he does a better job keeping his pads down throughout the play. Hand Fighting: Because of his upper body strength, Herman does a good job velcroing to the defender. In both the run and passing game, he always looks to gain inside hands—rather than taking the punch-and-recoil approach. Herman is absolutely someone capable of controlling the line of scrimmage and the movements of his opponent. Recovery: The ability to keep a wide base gives Herman a strong anchor. This allows him to remain balanced after the initial contact and quickly re-set. Opponents have a tough time moving Herman off the line or getting a push on the pocket. Herman’s pad level is the one thing that hinders his recovery. When he gets too high, the defender can use his quickness to compromise Herman’s balance. This makes it more difficult for him to then change direction and react to counter moves. Technique: Other than some inconsistency with his pad level, Herman plays with good overall technique. He shows a commitment to playing with balance and fighting to gain inside hand placement. These are two of the main keys for all offensive linemen. Future Role/Versatility: Herman is a guard, but could potentially play right tackle in a pinch. This doesn’t mean a team should go in that direction. Moving him to the outside would really play against his strengths as a player. As far as scheme is concerned, Herman features the skills needed to play in either a zone of power-blocking system. i like this pick. watching some tape on him, hes got a nasty streak. i like that. can see Reeses MO this draft was build the lines back up. Agreed I think he could very well end up replacing Bass next season. Good speed off the snap and good hand size. Watch the link, it looks like he was basically playing the center position from the right guard spot.